Ask your question NOW to have it answered LIVE in tonight's show. Remember the only silly question is the one you don't ask! 0 What Apps are Using Your Battery? Learn how to check what apps are using the most battery on your device. Let me know which app it is for you and how many hours and minutes over 10 days! Don't want to miss any tips? I would recommend this course to everyone interested in learning how to use the iPad. My wife and I attended a course by Colin Dunkerley with regard to the iPad at Samford Grove. Having been an Instructor/teacher in the UK for over 21 years, I must say I was very impressed with the content of the course, and the way in which it was presented. It has helped us overcome some problems, and also given us insight to what the iPad can do which we were not aware of. A most informative educational and entertaining course, presented with great enthusiasm by a man who knows his product well. I would recommend this course to everyone interested in learning how to use the iPad. Before attending your lesson I didn't really understanding the full capacity of the iPad. I learnt how resourceful it is and it now enables me to do everything I need on one product instead of my Laptop, Camera and GPS to name a few. The ease of the course complimented by the backup coloured illustrations for further referral should our memories fail us from time to time. I have been asked to participate in a Seniors Forum on the Sunshine Coast to help communicate the issues facing Seniors when dealing with technology and technology companies. Or any other issue you would like me to raise or to help change. Please leave your comments below and I will use them to make sure we focus on the most important issues you face when dealing with technology. Please keep your comments on topic about issues facing seniors. Save questions about iPad questions for one of my Ask The iPad Man shows. I will answer the number 1 question asked this week…. Is my Google account being shut down? I will explain the email that every Gmail or Google account holder has received. AND I will do my best to answer any other questions you may have. The only silly question is the one you don’t ask! In this 6 minute video you will see how quick and easy it is to have your iPad or iPhone fill in all your details in a form. Wish me luck in the Bondi to Bronte swim too!! In this 45 minute video you will learn.. I hope you have had time to keep up to date with the FREE iPad tips I'm sending each week. I'd love to hear about the progress you are making! I don't do this often and I'm a little uncomfortable asking for your assistance when I genuinely value the support you give my business but I have a really big favour to ask of you. 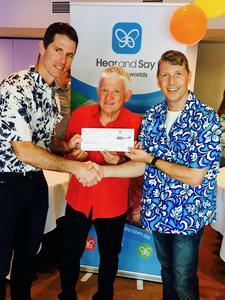 Each year I work with my great friend and mentor, Barry Bull (The Music Man - Toombul Music), to help raise money for Hear & Say with a special concert called "the Gift of Sound". The morning concert, to be held at 10:30am on Friday 31st August will be one and a half hours of great music and inspirational stories shared by "The Music Man" - Barry Bull & "The iPad Man" - Colin Dunkerley. Tickets are $29 which includes lunch to be served at 12:30pm. The Moolooolaba Bowls Club have generously supplied the room for free and discounted lunch to $10 meaning we are able to pass on a full $19 per ticket to Hear & Say. (The iPad Man is covering all fees and charges). Hear & Say is a wonderful organisation that helps children who have severe hearing impairments to make sure they don't miss out on the incredible technology that exists today to help them listen & speak. 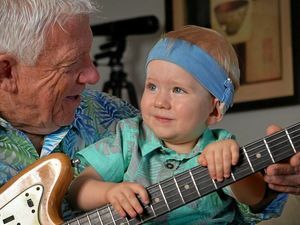 Barry has become Queensland's ambassador for Hear & Say because his grandson Archie was born profoundly deaf. After seeing the wonderful work done by Hear & Say for his own family Barry has made it his mission to help other children by doing an annual fundraiser for Hear & Say. 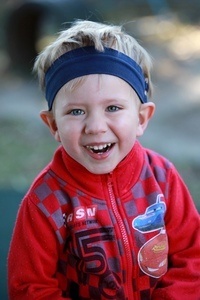 These funds don't go to Archie but to other families who are in need of Hear & Say's assistance. Please book your ticket/s below or if you would like to book an entire table of 8 call Tianne on 1300121259 to make the process of booking easier for you. We know that life can be incredibly busy. If you already have an appointment this day but would like to contribute anyway please make a donation. It has been incredible to see the progress of this young man because of the life changing Cochlear implant that has allowed Archie to listen and speak. At last years concert he even came on stage and started to sing as well as played the guitar! None of this would have been possible without the Support of Hear & Say. Once again we thank you for any support you are able to give. Do you want to learn the easiest way to create professional looking documents? Plus a few tricks you wish you'd known about before! In this short video you will learn how to find the best paid and free books using Top Charts. There are hundreds of thousands Free books to read in the iBooks store but how do you know if they are any good? You will also learn how to browse the top charts by category allowing you to view books, as an example, by "Crime & Thrillers"
Let me know if you read books on the iPad.